A Ratpoison screenshot showing the screen divided into "frames." The upper right shows the Gimp, the other two frames are terms. I used 1.2.2. The latest available version in October 2003 was 1.3.0beta3. Inside the window manager, "Ctrl-t ?" gets you a good help screen. The man page is also good. Ratpoison is the Emacs of rodent-agnostic window managers. Every command is of the form "Ctrl-t <something>", and the keybindings have been specifically tuned to not clobber Emacs. Another program that inspired Ratpoison was "screen." All windows appear full screen (or occupying all of their frame, if you've subdivided the screen) without decorations. There is no way to resize windows, although you can split the screen into smaller areas. There are no workspaces, which I thought was badly needed. A hint on the web page suggests workspaces are in CVS. The most important command to remember is "Ctrl-t ?" which gets you a full screen of help (which doesn't fit on a 640x480 screen). Another helpful command is "Ctrl-t C" which starts a new terminal. 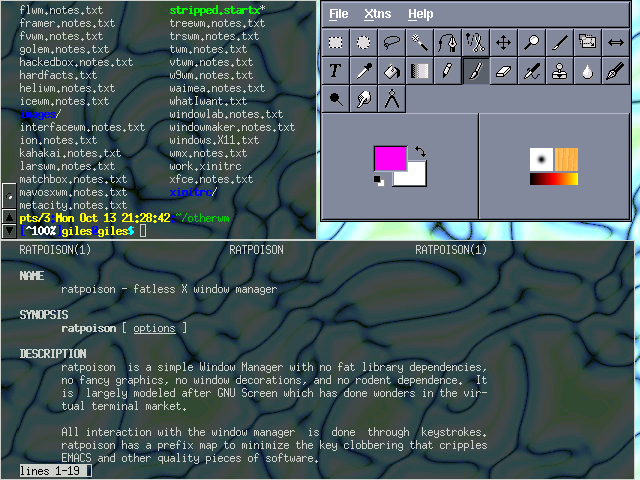 Screen's influence can be seen in the commands "Ctrl-t Ctrl-t" to toggle between the current and previous window, and "Ctrl-t N" which goes to the next window. I had several major problems with Ratpoison: I couldn't figure out how to unsplit frames. There is no way to have something be full screen once you've split the screen into frames. And I witnessed applications mysteriously relocating from one frame to another. Overall, it seemed to me that this was a rather poorer version of Ion. Ion does all the same things and it does it better. The only drawbacks of Ion over Ratpoison are that Ion uses titlebars and is slightly larger than Ratpoison (which is incredibly small). Incredibly small - about 500 kb in memory. No workspaces. Awkward. Possibly buggy.